iPad 5, iPad mini 2 to take the stage during Oct. 15 Apple event? We may be a little more than a month away from the next big Apple reveal, if the latest chatter is to be believed. The word coming from sometimes-iffy French site MacG.co (Google translation) is that Apple is planning a "special event" for Tuesday, Oct. 15. It's widely thought Apple will debut the iPad 5, iPad mini 2 and possibly new iPods and new Macs next month, following the September debut of the iPhone 5S and iPhone 5C. 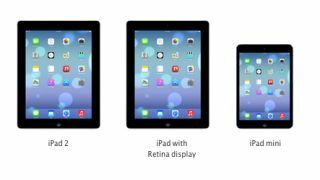 MacG stated the "new iPad" will make an Oct. 15 appearance, though we fully expect to see more than one product come Apple's next gathering. Apple is no stranger to holding separate September and October product announcements. The company unveiled the iPhone 5 and new iPods in September 2012 before announcing the iPad 4, first iPad mini and new Macs during an event one month later. Also according to today's report, iMac stock is at an all-time low at Apple Stores, a sign that Apple is flushing supplies in anticipation of an imminent new release. In addition to new iMacs (probably running Intel's Haswell chip) and all the products we've already listed, we could also see the release of Mac OS X Mavericks, something on the Apple TV front and the long-awaited iWatch. Will it be an October to remember for Apple? The clock is seemingly ticking until we find out. Pre-orders for the iPhone 5C are open now, but is the phone worth purchasing? Check out our hands on review to see for yourself.